Colonial discourse is defined as a “complex of signs and practices” (Ashcraft, Griffiths, & Tiffin, 1998, p.235). In the light of this statement this research article investigates following main questions. 1-What are those signs and practices which constitute colonial discourse?  2- How do they signify according to semiotic theory? 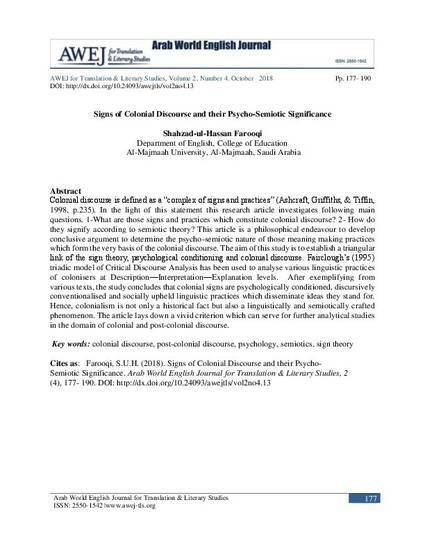 This article is a philosophical endeavour to develop conclusive argument to determine the psycho-semiotic nature of those meaning making practices which form the very basis of the colonial discourse. The aim of this study is to establish a triangular link of the sign theory, psychological conditioning and colonial discourse. Fairclough’s (1995) triadic model of Critical Discourse Analysis has been used to analyse various linguistic practices of colonisers at Description—Interpretation—Explanation levels. After exemplifying from various texts, the study concludes that colonial signs are psychologically conditioned, discursively conventionalised and socially upheld linguistic practices which disseminate ideas they stand for. Hence, colonialism is not only a historical fact but also a linguistically and semiotically crafted phenomenon. The article lays down a vivid criterion which can serve for further analytical studies in the domain of colonial and post-colonial discourse.